The rebuilt banks along Vine Street look sturdy enough to last a century. 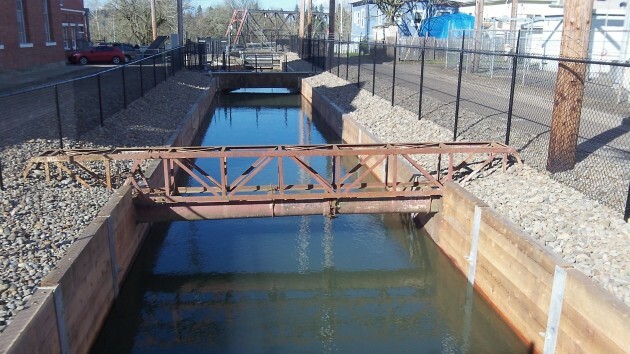 The good old Albany-Santiam Canal is back in the news, as it frequently is, and money is the cause. 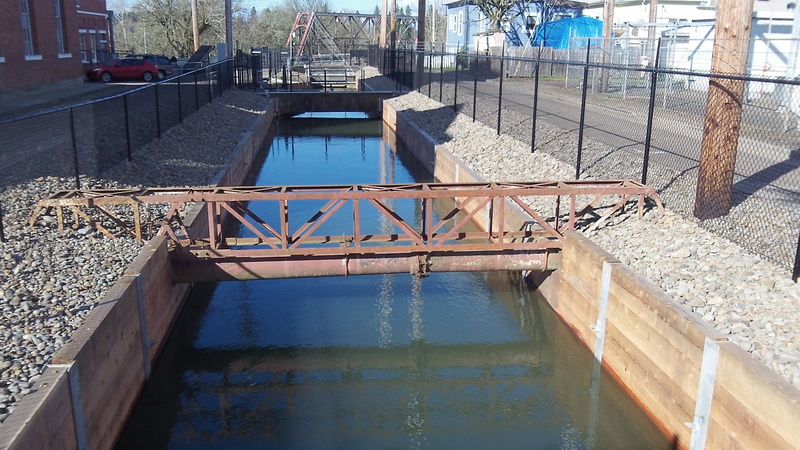 Albany plans to bill Lebanon for a share of canal maintenance costs. And in a seemingly unrelated matter, a contractor and the city of Albany are trying to settle on the final payments for a repair job that turned out more than twice as expensive as city engineers had thought. First, the Albany council Monday approved a proposal by City Manager Wes Hare on Lebanon’s share of canal maintenance costs. The plan is this: For the current fiscal year, which ends June 30, Albany will bill Lebanon $77,000, an annual amount previous public works chiefs for both towns had agreed on some years ago. Then, for fiscal 2016, Albany will send Lebanon a bill for one-third the estimated canal maintenance costs, as specified in a formal agreement dating back to 1986, two years after Albany bought the 18-mile canal from Pacific Power & Light. Public Works Director Mark Shepard told the council his budget for canal maintenance runs around $900,000 a year, which would put Lebanon’s share next year at $300,000. If there’s a disagreement — as there has been and surely will be again — the 1986 accord calls for a joint committee to try to settle it. The council authorized Hare to name Albany’s half of this panel. Meanwhile, at the Albany end, a contracting company with the unlikely name of Tornado Soft Excavation (stemming from its origin as a vacuum maker) in December finished rebuilding the canal’s crumbling banks along Vine Street between Third and Fourth avenues. The city had estimated the job at $170,000. Tornado was the low bidder at $265,942. Two other companies bid nearly $290,000 and $339,000, respectively. Once Tornado got to work, complications set in. One, according to company owner Pat Ryan, was that the city did not lower the water level in the canal as much as needed, which called for a costly dewatering effort during construction. Citing unanticipated subsurface conditions, problems with “earth anchors,” and the discovery of an underground “concrete mass” that had to be removed, Public Works got the council’s OK for change orders that raised the contract price to $320,707. On Feb. 11, Ryan went before the council and complained that the city had not fully paid him even though state law says it must do so within 15 days of accepting a job. Last week, Shepard told me Albany had paid Ryan about $275,000 so far, and Ryan told me he felt he was owed another $90,000 for a total of $365,000. The merits of each side’s position are beyond me, but as far as I know they’re still trying to work things out.